My family loves some beef jerky, especially my kids. It almost seemed like a waste to ever buy it from the store because a small bag ranged from $5-$7, and it usually was gone within the day. My oldest daughter is especially bad with it. She could easily clear 2 whole bags of beef jerky in one sitting. At that much a pop, that adds up! 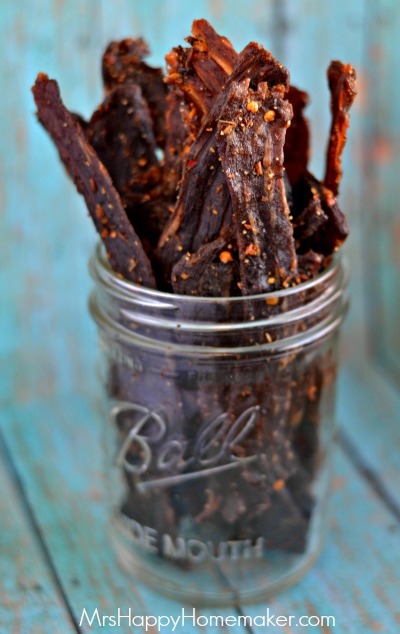 Because of my family full of beef jerky lovers and the cost behind it, I’ve been wanting to make my own beef jerky for some time now. I started researching dehydrators and was awful close to buying one, and then I just happened to find a used one at the thrit store for only $4, and I was sold at that price! It’s old, but it works – and for 4 bucks, that is all I can ask! If you don’t know this already about me, I love thrift stores. 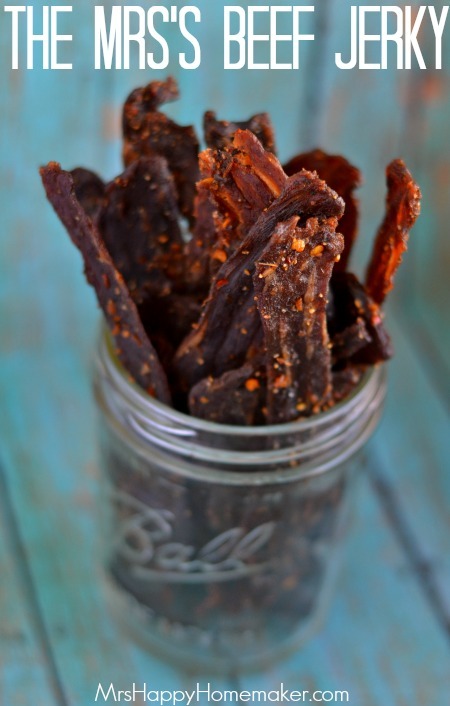 I’m also digging my homemade beef jerky. 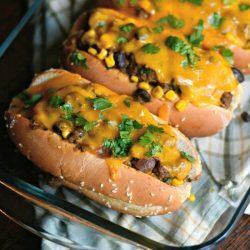 I searched throughout the worldwide web looking for a decent recipe, and tried several that were good but just weren’t ‘it’. 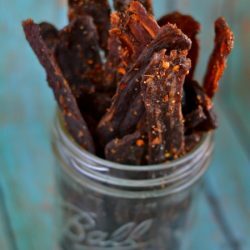 So, I started developing my own recipe and started off just adding things to the jerky marinade that I knew were good marinaders, and then adjusted it based on how the finished product tasted until I finally came up with what me and my family considered to be our perfect beef jerky. 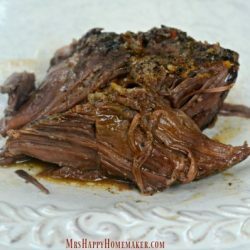 It’s got great beef flavor, with a hint of garlic – a little bit of spice. A hint of sweet – and a lot of deliciousness. I use my favorite brand of hot sauce that I first discovered after seeing it on Food Network about 10 years ago, Ring of Fire. You can use your favorite hot sauce for this, but I will say the flavor you get from the Ring of Fire is like none other. My second favorite hot sauce to use is Sriracha. For some extra spice, you could also add a couple of jalapenos to the marinade to really spice it up. Not only is it totally yummy, it’s also budget friendly. I usually make a ziploc gallon sized bag filled 3/4 of the way full for under $15, and that cost includes fresh local beef from my butcher. That’s a lot of beef jerky! And a heck of a lot of savings! Freeze your roast partially – this makes it easier to slice it thin. Once partially frozen, cut the roast against the grain in thin uniform slices. Combine the marinade ingredients in a bowl. Place the beef in a large ziploc bag (or other sealable container) and pour over the marinade. Seal the container, and refrigerate overnight – or at least for 8 hours. 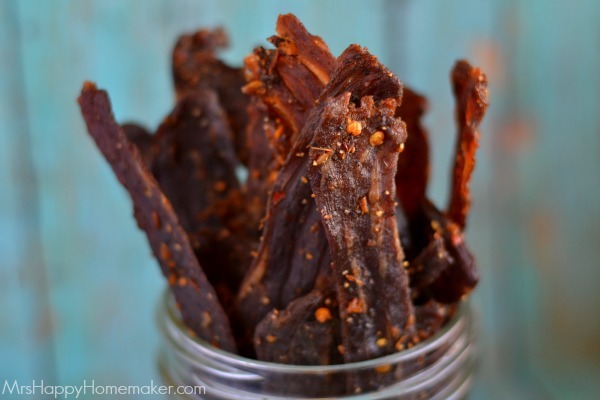 Drain the marinade off of the beef, and place the beef slices in your dehydrator. Run the dehydrator until the beef is thoroughly dried. Your dehydrator should have a guide as to how long this takes per your machine. It can take anywhere from 4-8 hours depending on your dehydrator. If you don’t have a dehydrator, you can also use your oven. Place your sliced beef on a wire rack set upon of a baking sheet, Cook at 165 degrees for 1-3 hours or until your meat is cooked thoroughly. 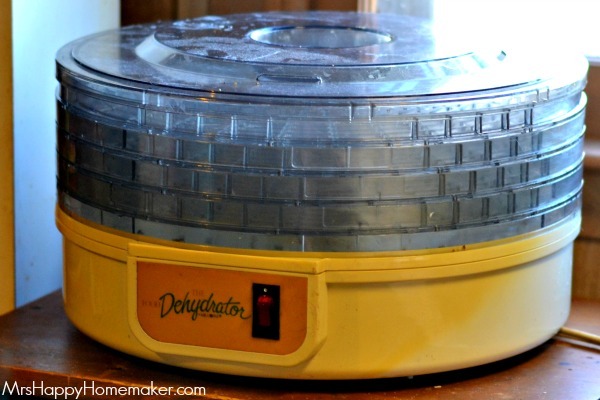 You mentioned you did some research on dehydrator’s – will you share that info. I am wanting to get one for all the summer fruits and veggies. Thanks for the wonderful recipe. Our new Samsung Gas range has dehydration feature. Haven’t had a chance to try it yet. A woman who use to work at a jerky company told me, I need to place the meat on trays with holes on them (like for BBQ vegtable tray) need air circulation. 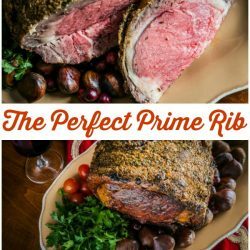 The grocery store butchers are willing to slice the meat 1/4″, they suggested “London Broil”. Your recipe says “bottom round beef roast ” suppose I could try some of each to see what I like best. I think the idea is lean meat. What kind of steak seasoning? Montreal? Does the seasoning have salt?